Early last month, we showed that one of Bank of America's "guaranteed bear market" indicators, namely the three-month earnings estimate revision ratio (ERR) which since 1988 has had a 100% hit rate of predicting upcoming bear markets, was just triggered. 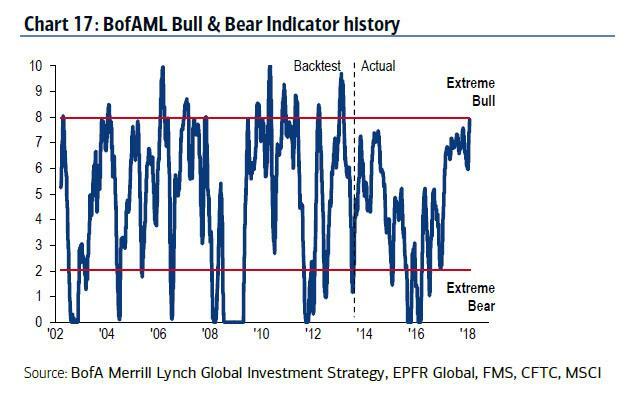 As Bank of America explained at the time, "since 1986, a bear market has followed each time that the ERR rule has been triggered." The only weakness of that particular signal is that while a bear market has always followed, the timing was unclear and the bear could arrive as late as two years after its was triggered. 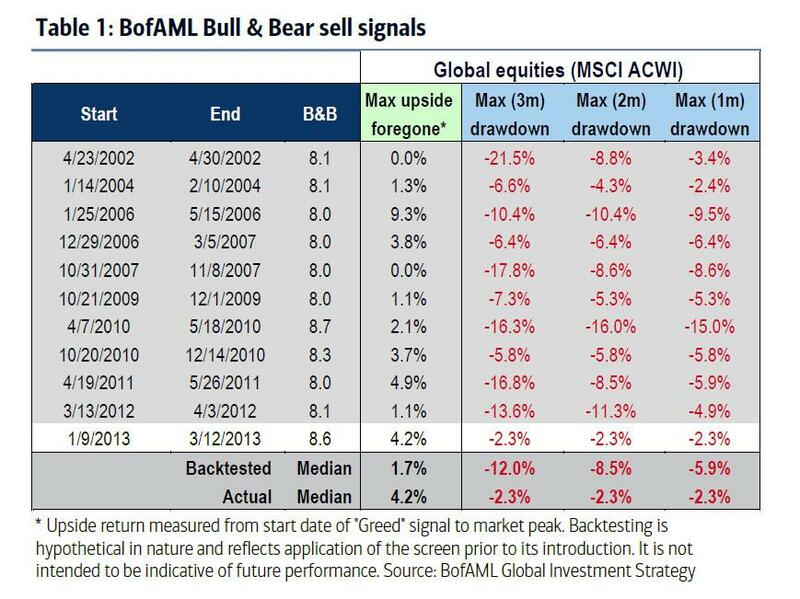 Well, fast forward to today when overnight another proprietary "guaranteed bear market" indicator created by the Bank of America quants was just triggered. 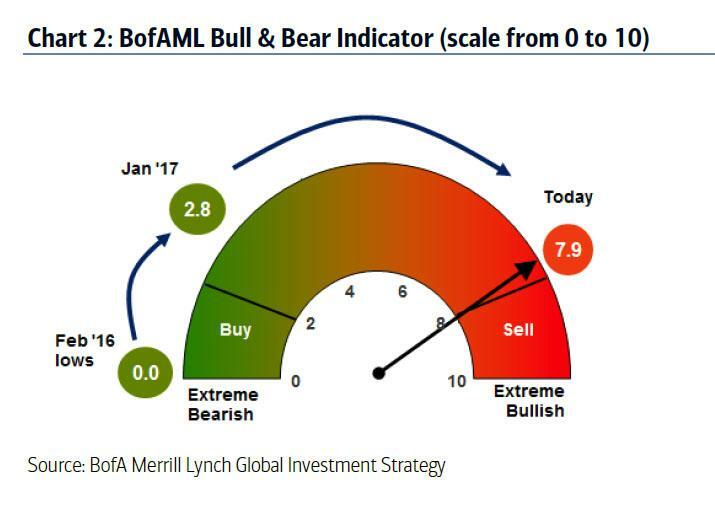 As we explained earlier today, as part of the unprecedented, historic rush to dump cash and buy any risk assets that one can find, BofA's "Bull & Bear indicator" surged to 7.9 - effectively 8 - a level that is indicative of broad market euphoria, and the highest it has been since March of 2013, or nearly 5 years ago. ... but on 11 out of 11 signals since 2002, the market dropped on average 12% after it was triggered. And yes, it also works in the opposite direction: the last Bull & Bear indicator flashed was a buy signal of 0 on Feb 11th 2016. Since then the S&P has been up on 22 of the next 23 months. Finally, and most importantly, unlike other "bear market" indicators which confirm if a crash is imminent but not when, this one gives an explicit time window: the market always dumps within the next 3 months once a Sell signal has been trigerred. BofA's conclusion: "a tactical S&P500 pullback to 2686 in Feb/Mar now very likely." As a result, buying some 3 month puts here is probably not a bad idea, especially after today's latest furious meltup which has made the cost of all downside protection virtually nil, and at this rate, delta hedgers may soon be giving away puts for free.